**Thank you for your interest in our Black Friday – Cyber Monday promotion. This offer has now ended. The available allotment of 300 certificates has now sold out. It’s baaackkk!!!! Our best and only promotion is back and it’s A-W-E-S-O-M-E!!! Between Friday, November 23rd and Monday, November 26th, Skydive Carolina will be offering our famous Black Friday Gift Certificate Sale for the 2019 skydiving season at an incredible rate of $159.00 ($50 OFF). This is as good as it gets! 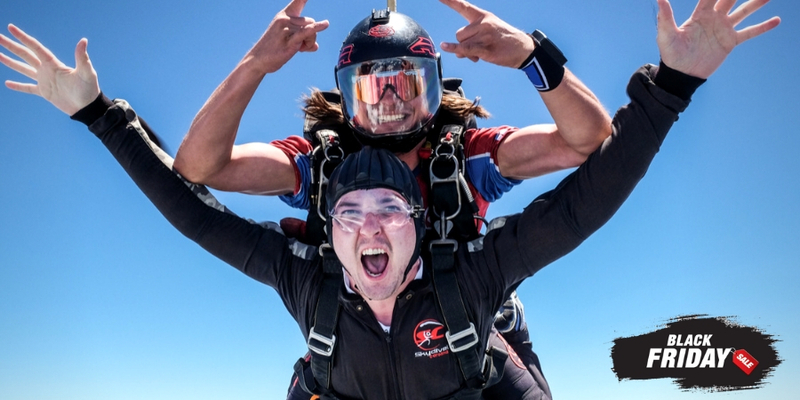 If you’ve jumped with us and would love to jump with us again OR you know someone who must experience the thrill of skydiving, please share this offer with them. **Limited Quantity: Only 300 certificates will be available for purchase. Promo may end before November 26th based on supply. Click on the Gift Certificate Button on the right side of the page or click here to purchase the greatest gift ever! Either way, you’re one click away from giving the gift of adventure at one great price!!! The certificate is valid for any operational days between January 2nd and December 18th, 2019. No participant may weigh more than 225lbs (no exceptions). Promotional value of certificates is valid for the 2019 season exclusively. 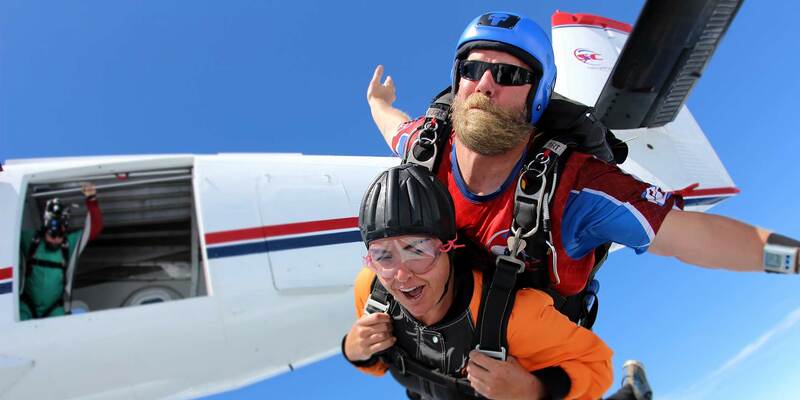 Actual value may be used towards the full retail price of a skydive after the 2019 season. The certificate is valid for one tandem skydive only and may not be used towards merchandise. Promotional sale available from Friday, November 23rd thru Monday, November 26th. Q: Can this promotional gift certificate be used during the 2018 season? A: No. The promotional value of the certificate is valid for 2019 exclusively. Q: Can someone under 18 jump with parental consent? A: Regrettably, no. All guests must be 18 years of age on the day of their jump. There are no exceptions. Q: How is the gift certificate delivered? A: Gift certificates are handled electronically and will be received within minutes of purchase via e-mail. Q: How are gift certificates redeemed? A: Gift certificates can be redeemed by scheduling online or by contacting us directly at (803) 581-5867. Q: What is the refund policy on these certificates? A: Due to the limited quantity of this offer and deep discounting, gift certificates are nonrefundable. They may be transferred or privately sold. Q: What is the difference between promo value and actual value? A: The promotional value of $159 can be used for a tandem skydive exclusively during the 2019 calendar year during published operational hours. The promo value will expire after the last operational day in December of 2019. Thereafter, the actual value can be applied towards the published price of a tandem skydive. Q: Is this actually a good deal? A: Yes, it’s a great deal! Skydive Carolina’s major point of difference is the altitude we fly to and the type of aircraft we use to get you there! We use a 23 passenger Twin Otter or 14 passenger, King-Air. Our aircraft are more spacious and comfortable than other operators in the region and we fly to the highest altitude. You get the ultimate skydiving experience for the lowest price you’ll find anywhere! Additionally, our Black Friday-Cyber Monday is the only major sale we have during our calendar year. Q: Are there any hidden fees or associated costs, I need to worry about? A: No. None. Nada. No surprises or bait and switch. The same great experience you’ve come to expect with Skydive Carolina. College Student Spring Break Special!